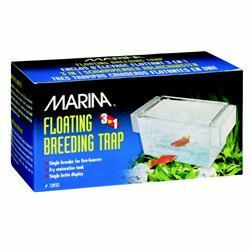 The Marina 3 in 1 Floating Breeding Trap comes with all the accessories for an all-in-one, self-contained live-bearer breeding tank. A safe floating haven for live-bearing fish and fry, it has a chamber for expectant fish and a V-shaped bottom compartment that safely collects and protects falling fry. It can also be used as a betta fish enclosure as well as for segregating sick or aggressive fish.